Creepy, crawly parasites have no business in your home, hiding in your furniture, lurking in your clothing or worst of all laying eggs in your bedroom. Bed bugs are a year-round nuisance whose presence tends to heighten during the summer months as these hitchhikers easily tag onto vacationers in the warmer weather, who then discretely transport them anywhere and everywhere. Should you experience an unfortunate encounter of the bed bug kind, here are steps to consider to manage and treat bed bugs. The first step is to be sure you’re dealing with genuine bed bugs. These pests are masters at the game of hide-and-seek and can be difficult to detect in the daylight hours. Bed bugs are wingless insects that have a distinct reddish brown color with oval-shaped bodies that tend to be about the size of a sunflower seed. They are foul-smelling, have a distinct antenna, and beak-like mouth used for sucking blood from their human hosts. Secrecy is the name of the game for bed bugs and they tend to gather and collect in areas including furniture seams and corners, pockets of couches, and under cushions and mattresses where they may be difficult to find. Clothing piled on the floor or items stored under beds are also desirable nesting areas as bed bugs tend to thrive in spaces that are cluttered. 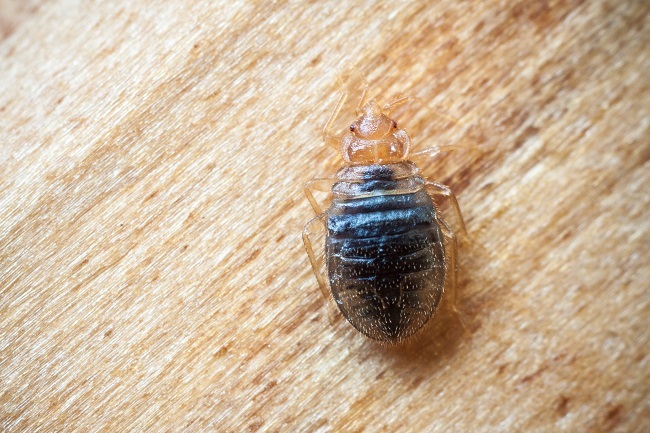 One way to affirm the presence of bed bugs is to find evidence of their bites. Bed bugs feast on human blood and are said to devour as much as six times their weight in a single feeding. While the human host may not realize they are they the main course at the moment, identifying the classic itchy raised welts left behind is a sure sign bed bugs have found their way into your home. While the thought of bed bugs may be enough to make your skin crawl, there is no substitute for professional services to eliminate the problem. The experts at AJB pest professionals will work closely with you, guiding you through a clear and effective process using multiple techniques to rid your home of bed bugs once and for all. Contact us with questions today for a better night’s sleep tomorrow!